Mama used to say ‘pahali utupwa si pahali uangukwa’, which translates to ‘where it is thrown is not where it falls’. She used it to remind us that whereas we can initiate actions we can’t control reactions. Then on one of those very hot summer afternoon’s, where only those with a chicken brain are outside – I ran into her. Big Mama and her brood of twelve chicks just about to cross the road. 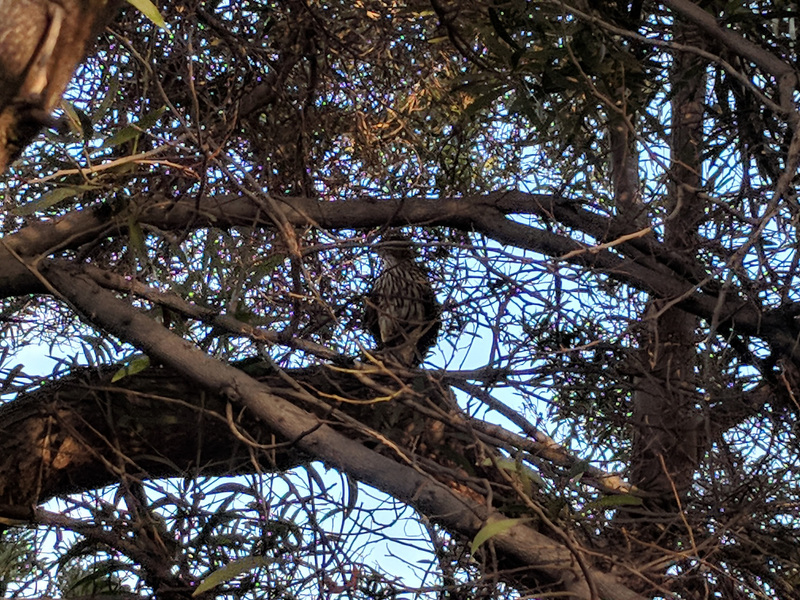 They looked like they had just been hatched and were about to die of thirst, I offered them water on my palm and she followed me with her family. That was how a rescued chicken family became family.. 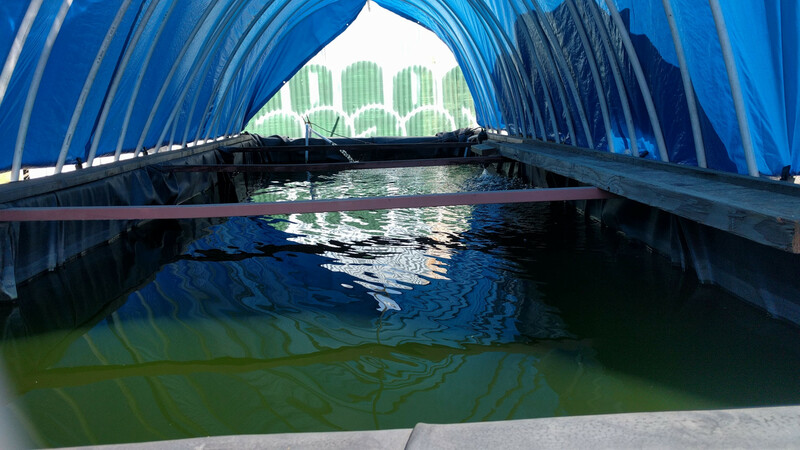 I had nowhere to keep her safely at first so I made her a quick home underneath an old aquaponics grow bed. 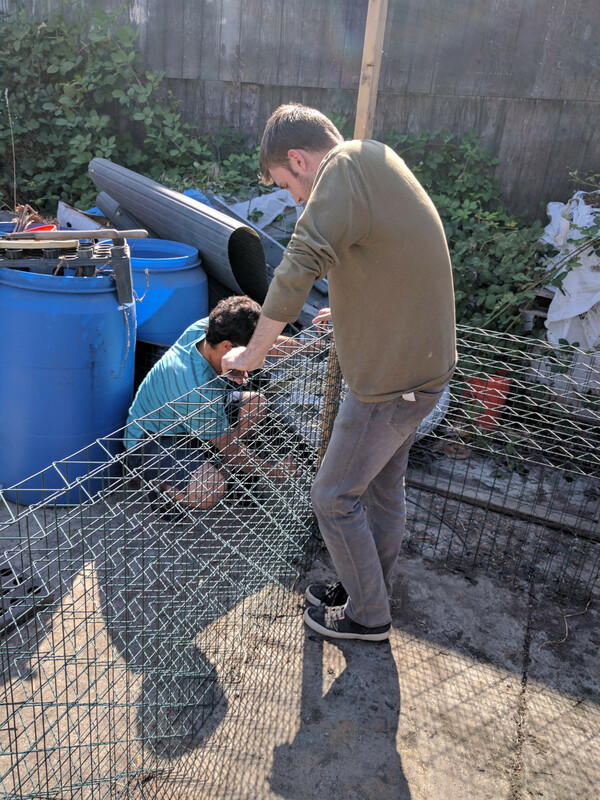 He just wouldn’t get it and kept escaping, no matter how many times we tried telling him it was for his own safety – that was how stupid got his name. 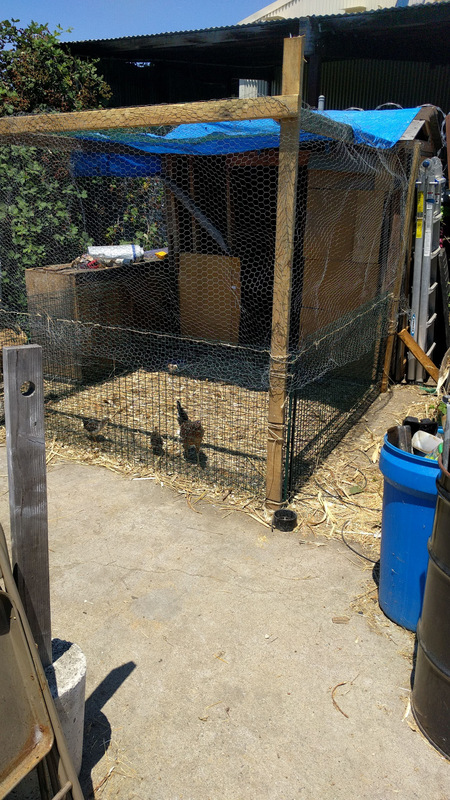 And grew … so quickly they started to behave like little chickens. 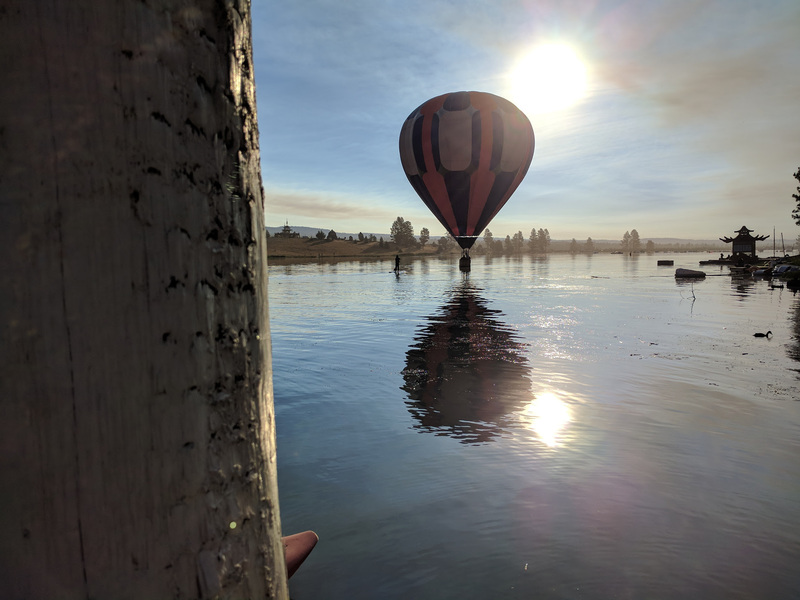 Then one morning at a mountain desert, a hot air balloon I was watching float lazily in the sky was forced to land in water. Of course freedom is never really free, predators always lark within. Here is one of our beautiful resident birds of prey. She terrifies the girls with her swoops but has not been able to get past the rooster defenses. Then I noticed she would pull the occasional Houdini and disappear. 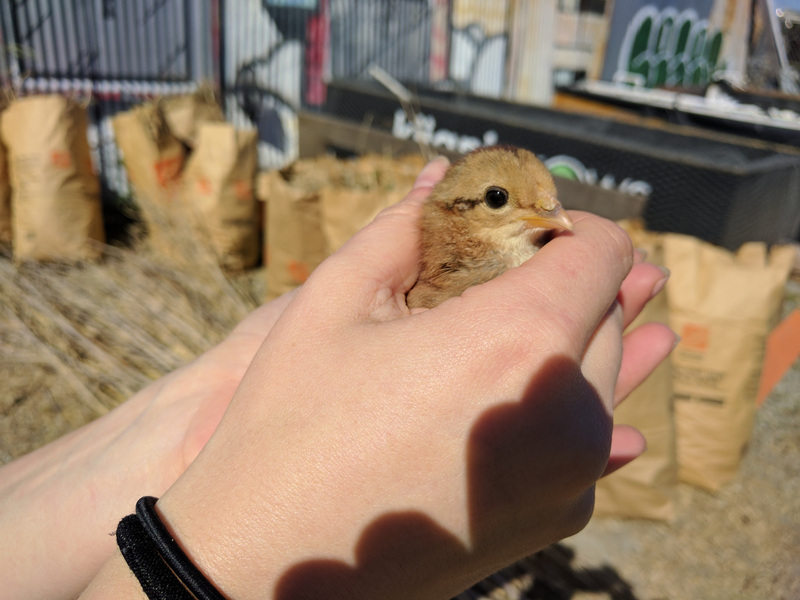 Then we started finding and confiscating clutches of eggs all over the yard. And so we built her circular laying boxes out of buckets and she picked up on it really quickly thanks to a couple of golf balls. I can’t help but feel she is asking “What the chicken are you looking at, can’t a girl lay eggs in peace?”. We have a symbiotic relationship, We feed and give her family shelter in exchange for breakfast,. 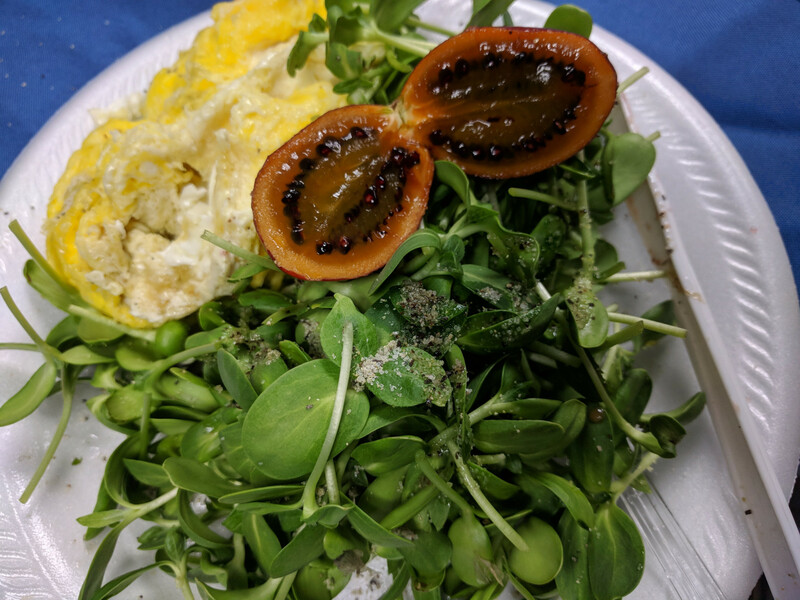 Breakfast at the farm is fresh and yummy- eggs, sunflower sprouts and tree tomatoes. At this point maintaining a secure free urban lifestyle for Big Mama’s family is taking its toll – transportation to release them in the morning and lock them in the evening, feeding them, watering them, fighting rodents, chasing wild birds, looking out for predators, cleaning the coop and even shopping for chicken feed. 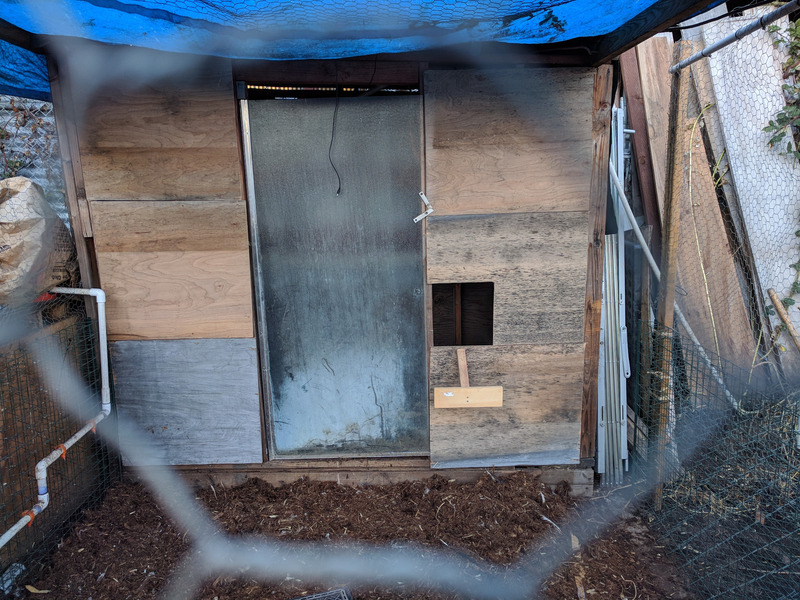 Time is expensive and when we could not afford it, Big Mama and her family paid the price – they stayed locked up in the coop without food. The water trickles down when the metal tip is depressed or moved to the side. 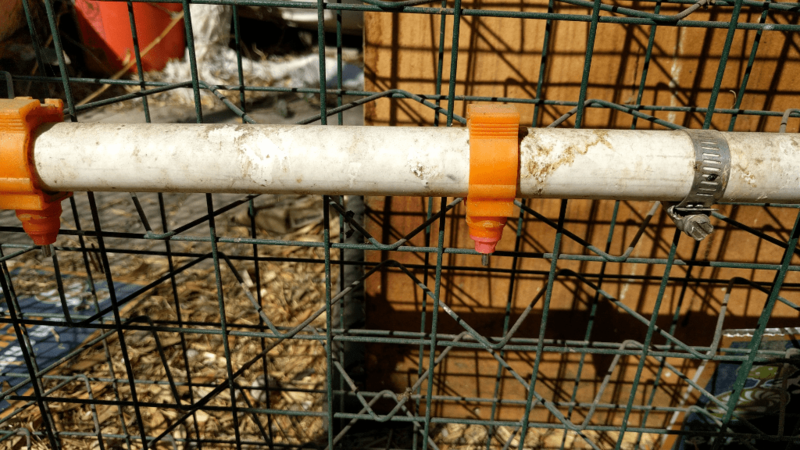 We also created chicken feeders using PVC pipes that could hold grain for a longer period. Both the water and food dispensing mechanisms made it easier to care for the chickens, but had unintended consequences. We became the official eat all you can buffet, as everybody in the neighborhood figured how to feast. 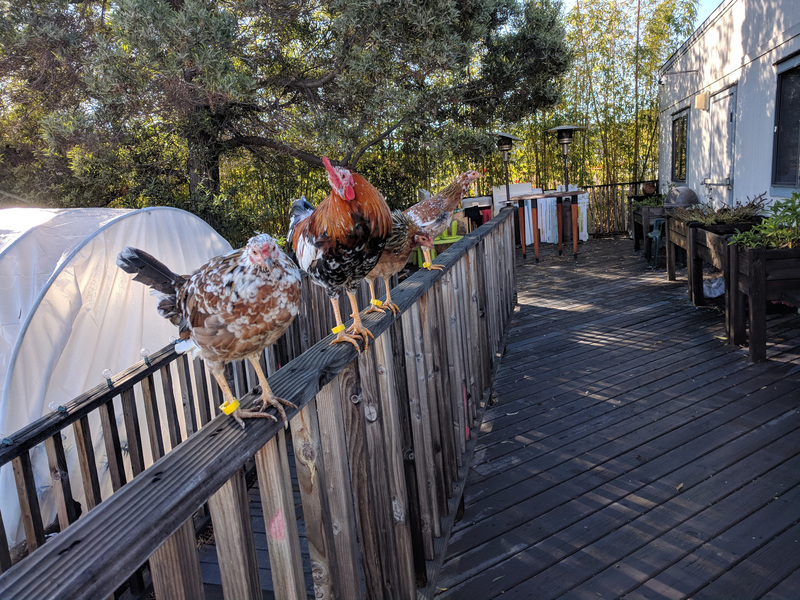 Every morning something appeared amiss, like the broken feeder on the top right above and I kept wondering why the chickens were so destructive. My first hint to this problem was when the chickens would reluctantly return to their coop to roost after sunset. 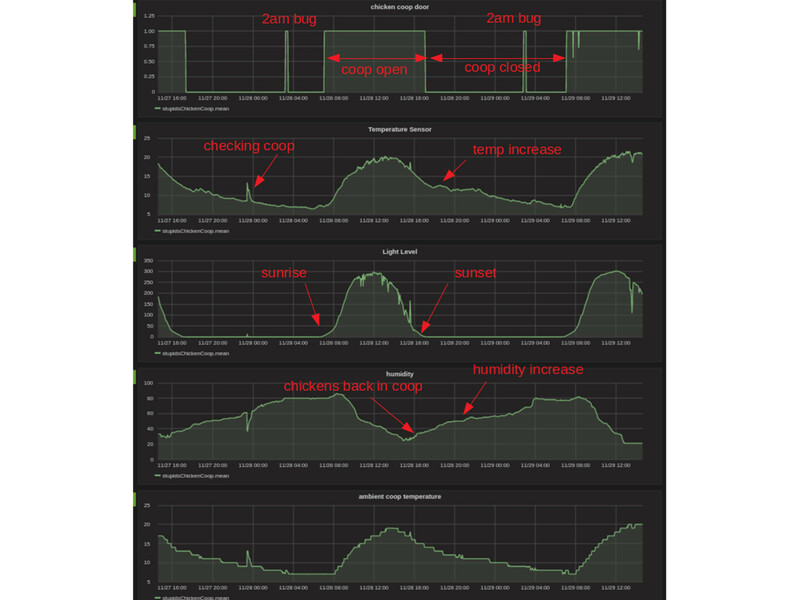 So I installed a smart v2 controller in the coop to understand this problem better. 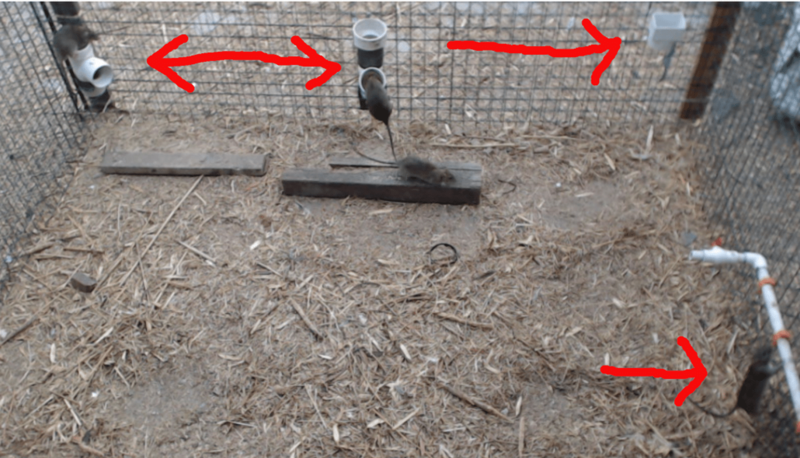 I captured the images of the rats feasting on grain and drinking water using the v2 time-lapse camera feature. I never anticipated such a severe rodent infestation, humongous rats seemingly appeared from nowhere drawn by the food and water. 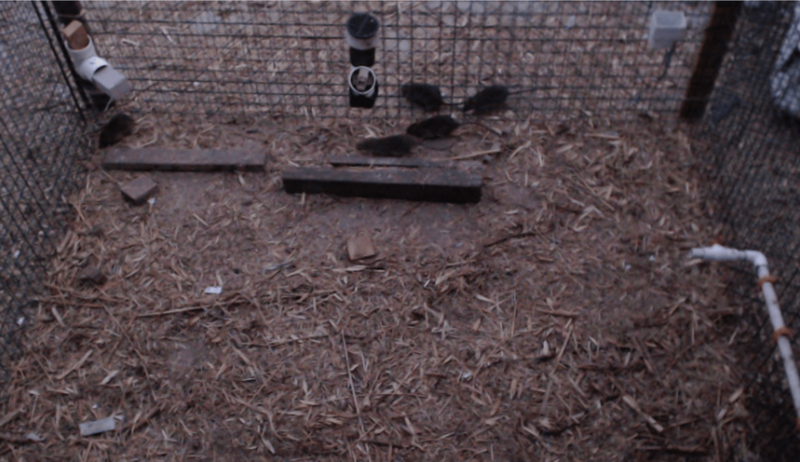 Can you count all eight rats in the picture below and it’s not even night yet when the alpha rodents appear. 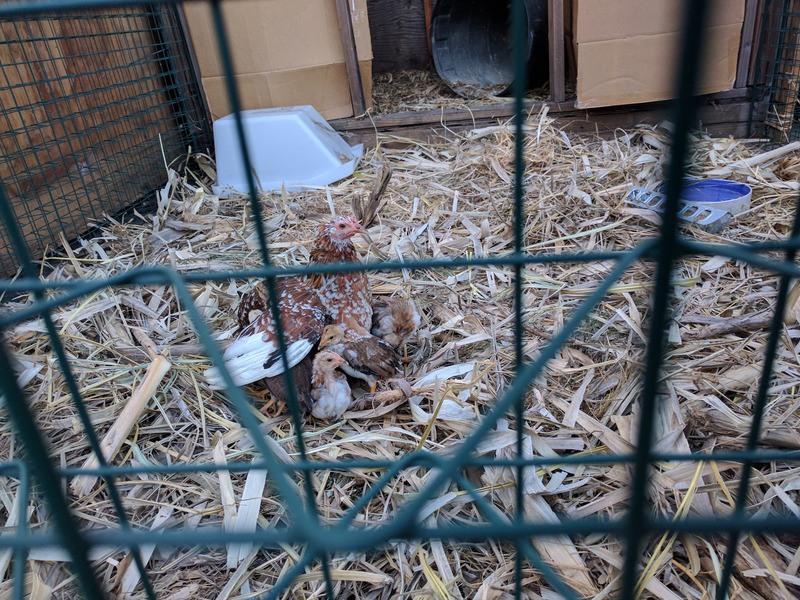 We stopped feeding them inside the coop and started to feed them outside in open yard and this reduced the rat problem significantly..
Then it started getting cold as winter was approaching and I noticed the chickens were jostling for the higher roosting positions to avoid the open walls in the coop. 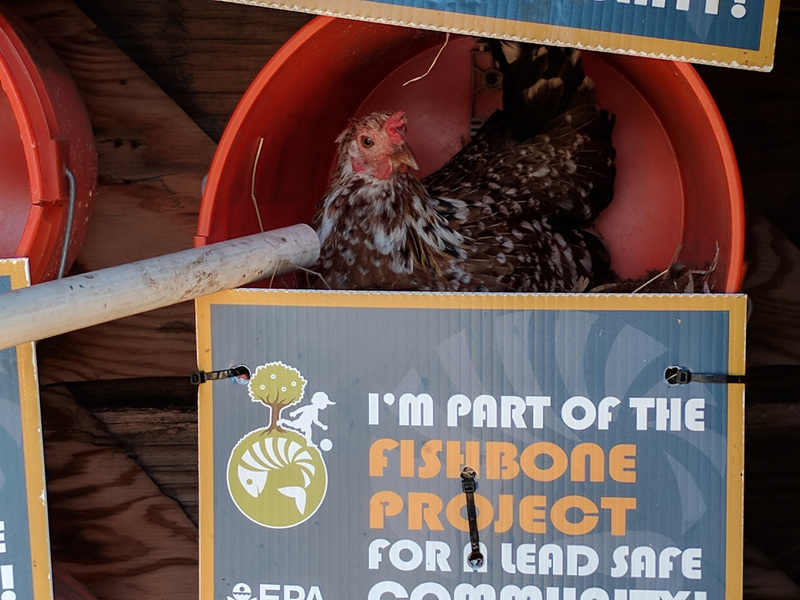 I never thought pieces of PVC pipes would be worth fighting for, but I guess it’s a chicken’s life. So we build them a winter wall, added a human door and a square chicken porthole. Then we added a linear servo actuator for opening and closing the chicken coop door. This is driven by the v2 controller which currently opens the door at sunrise and closes it at sunset automatically as is seen below. 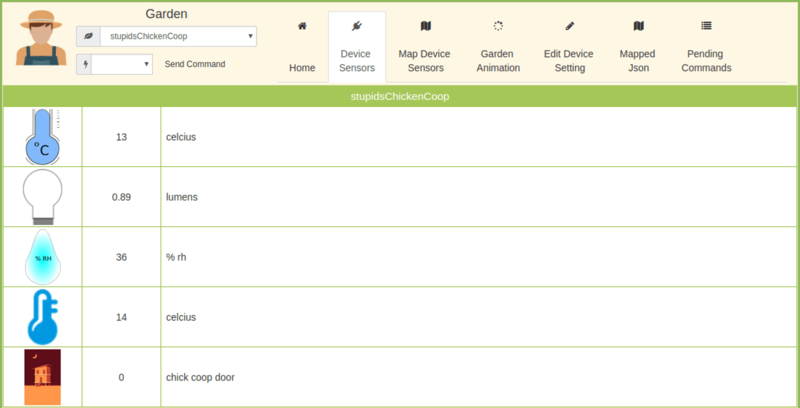 The environment sensors in the coop and door status just before sunset are shown on the v2 dashboard image below. The dashboard below shows the state of chicken coop just after sunset. 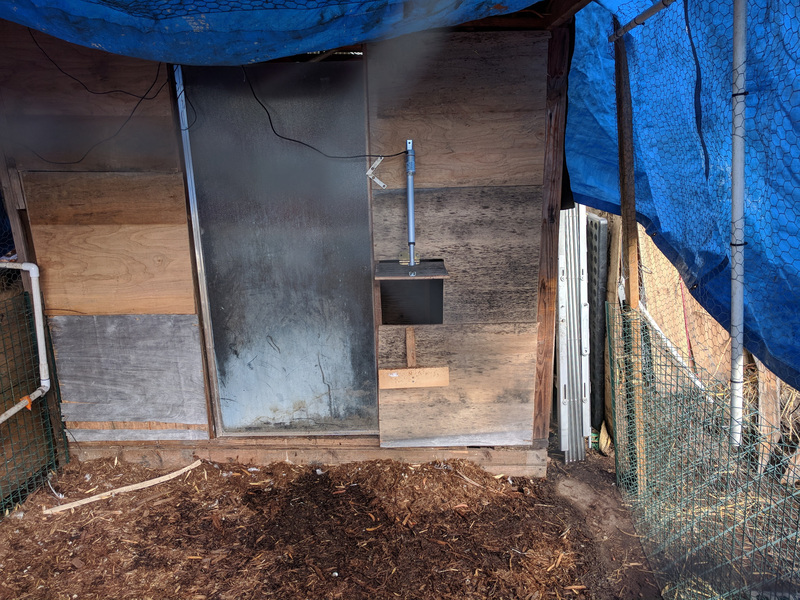 Notice how darker, colder and more humid the coop becomes within minutes. While looking for motivation to sketch a chicken coop icon I found this chicken coop sketch by drew. I modified it by swapping the night chicken to create a temporal coop icon using one of my favorite open source program gimp. It is very easy to customize device and sensor icons using the v2 controller and to create icons using gimp. The chicken coop trends are shown below. Notice the door opens and closes with the light level as expected even though its algorithm is based on a location’s sunset and sunrise computation. 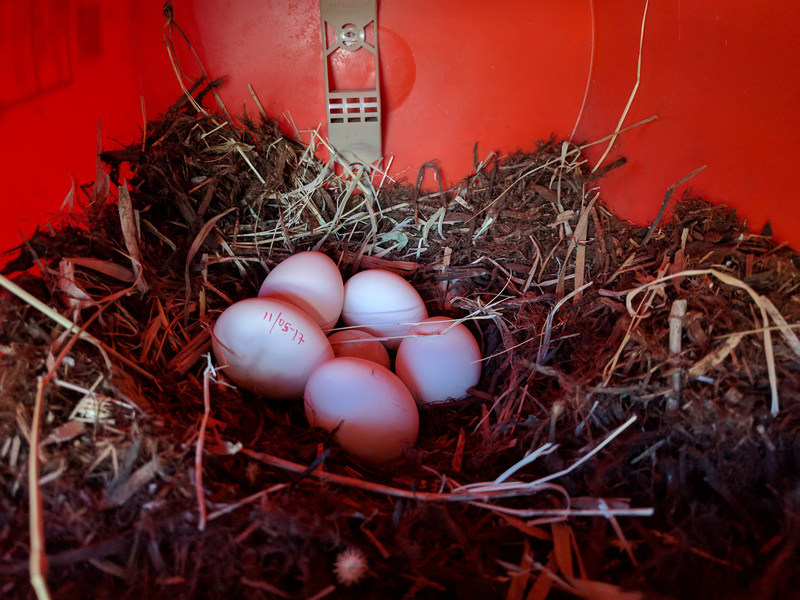 This tells it is safe to use the light level sensors to determine when to open/close the coop door for the chickens in future applications – you really don’t want your chickens locked out. 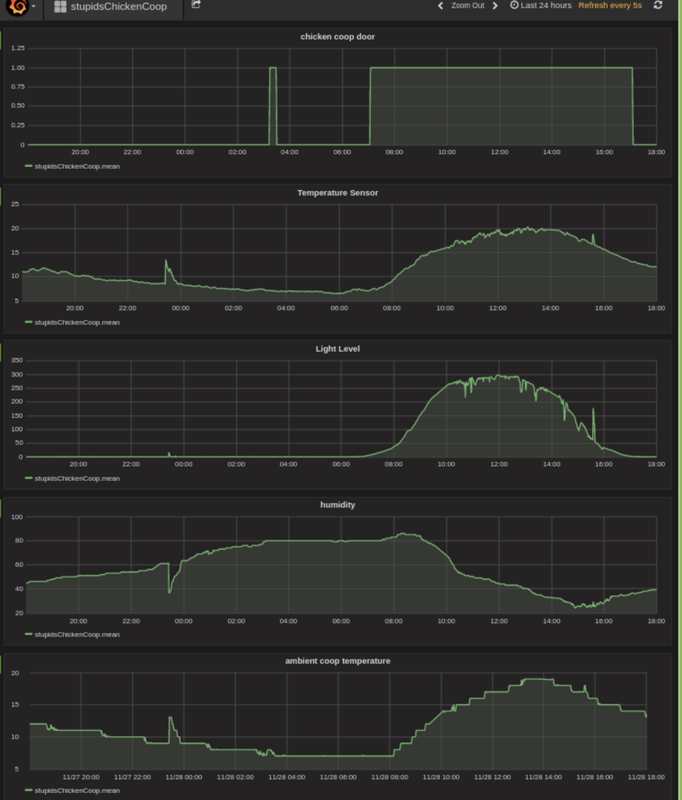 We are still not tracking the chickens using electronics sensors, but can infer when the chickens are in the coop based on how the humidity starts to suddenly rise followed briefly by the temperature. Normally temperature and humidity go opposite but the chickens breath and body temperature cause these two environmental variables to increase at the same time. 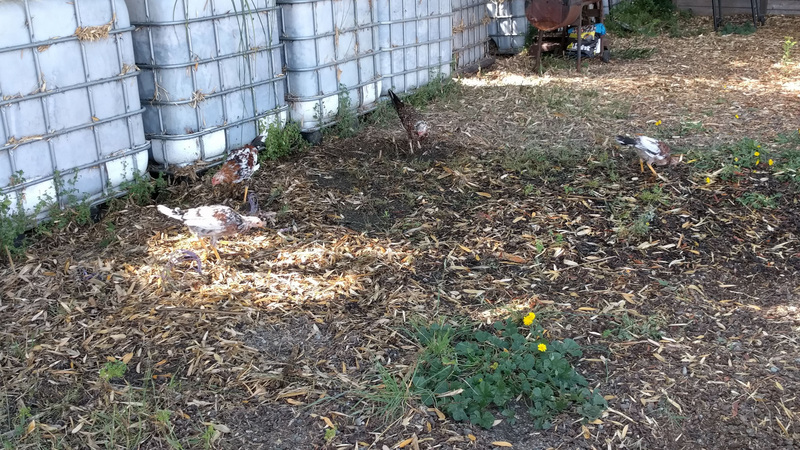 This is kind of the environment that mold loves – hot and humid, which is another reason why free ranging chicken is healthy. 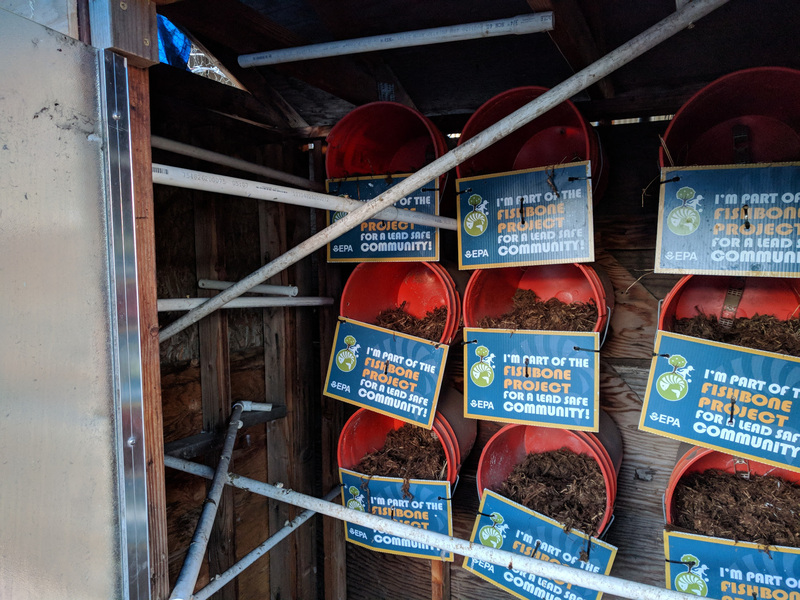 Our coop is well vented so after a moment everything stabilizes and the temperature continues dropping as the humidity increases, averting another potentially moldy environment. Everybody is happier, Big Mama and her family are outside at sunrise foraging and they are back at home before sunset. Coop is opened and closed automatically. 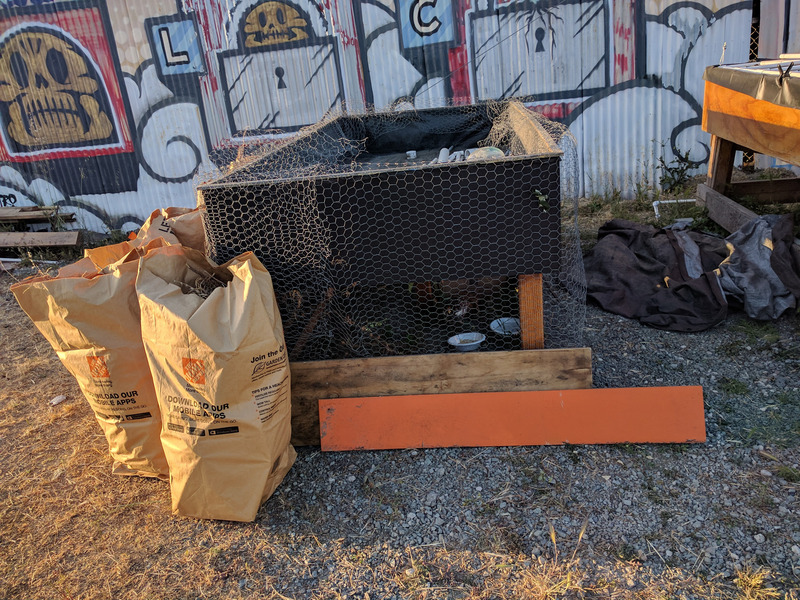 We still put out food and water for the chickens out in the yard and put it away at the end of the day. This has reduced the rodent infestation. 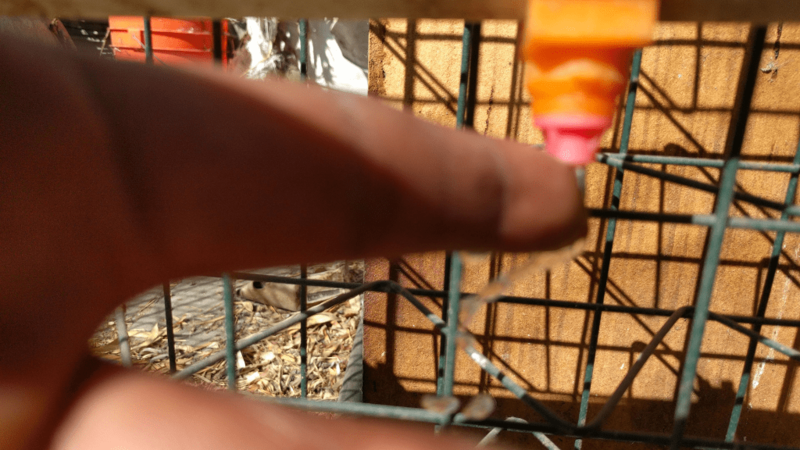 But the resident rats have learned to sneak and eat the chicken food during the day when nobody is looking The wild birds are still eating up the chicken food though their numbers have dwindled with the cold. 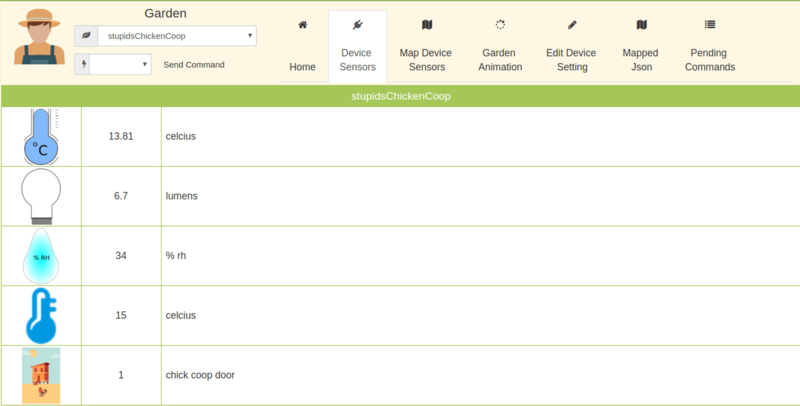 We are currently designing and building a system that will only allow access to food, water or the coop using RFID. The passive magnetic coils are embedded in poultry identification foot ring tags that can be read using a v2 controller. I should stop calling them babies as they are really growing up, as compared to Big Mama (top left) who seems to be shrinking especially when she is broody or shedding her feathers. 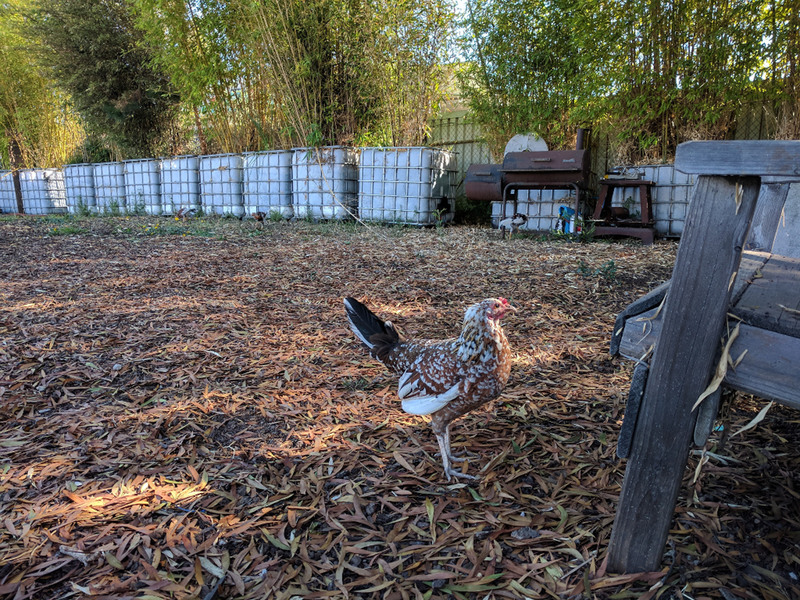 Amos – we have four handsome roosters growing crazy fast like him. Life is amazing, I almost cannot imagine that I used to hold him in the palm of my hand, It’s a madhouse here – unless they get a pardon, three of the roasters may make a halal visit to a smoker. 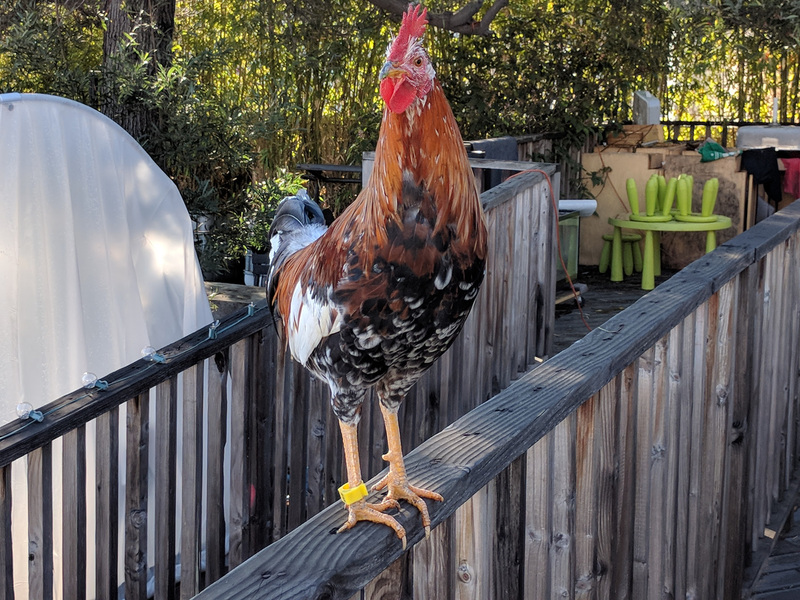 The over-sized RFID foot ring is dangling from his foot and it evidently bothers the chickens when they run around the yard especially the smaller girls. Considering all the airborne predators around I pulled out the RFID rings to restore their natural edge. I am testing other versions but I have not found something suitable in terms of comfort yet – they are either too big, too small or too human. In addition to cameras, RFID tags, the tracking system will include weighing scales and other sensors. 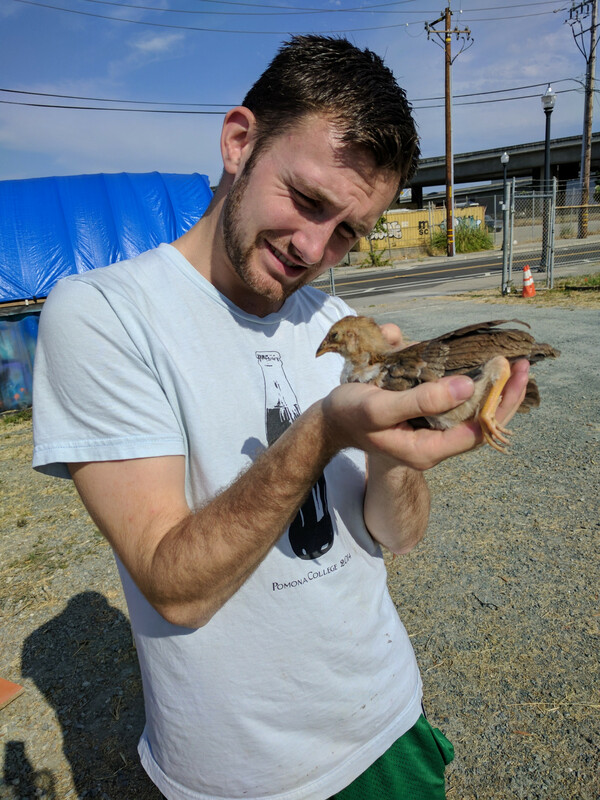 I have been around chickens often growing up among farmers, but I have never been responsible for chickens before. This is very educational. Whereas I planned to raise chickens on the farm, I was not ready and Big Mama turned out to be a crash course. 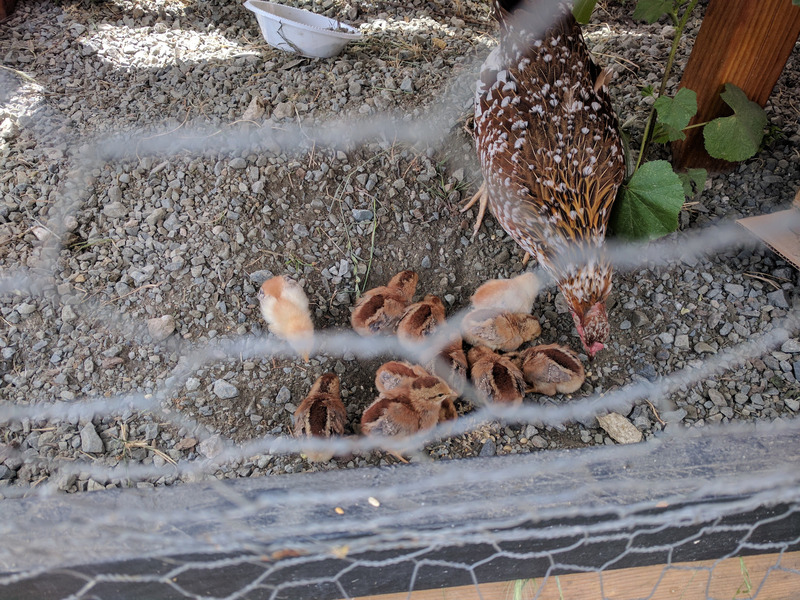 I lost two chicks out of twelve. 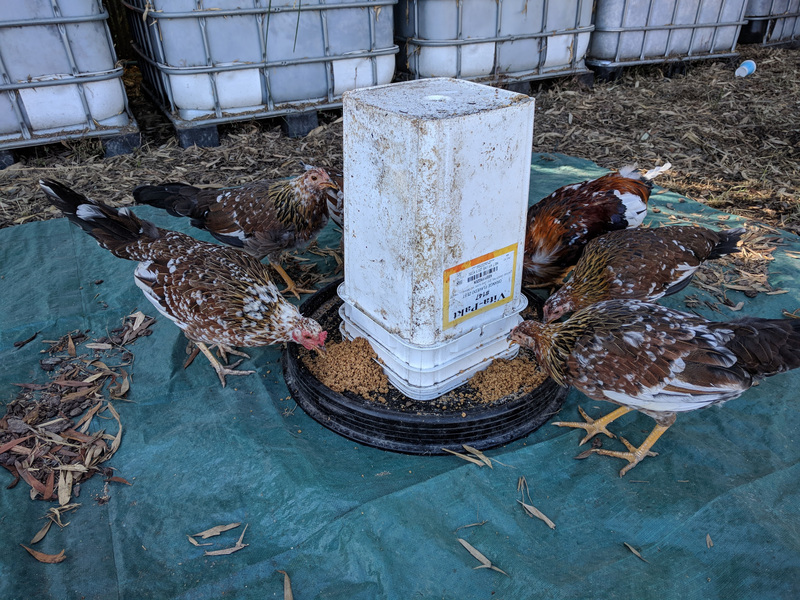 It is nice to finally start integrating those lessons into building a data driven smart system for chickens that allows them to free range. 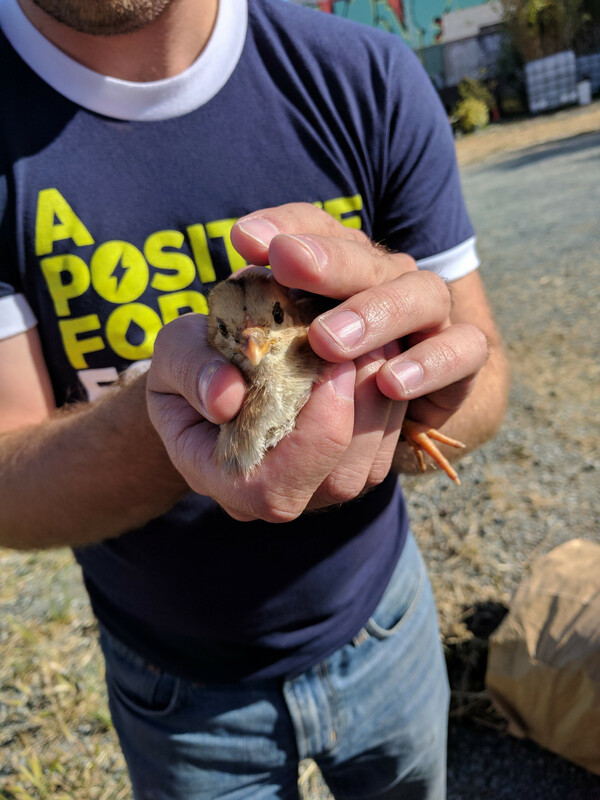 I hope to learn more, when they eat, how much they eat, how they sleep, when they lay eggs, who lays the most, how they respond to predators, pests etc., so we can build tools that help solve these problems for urban and commercial chicken farmers. 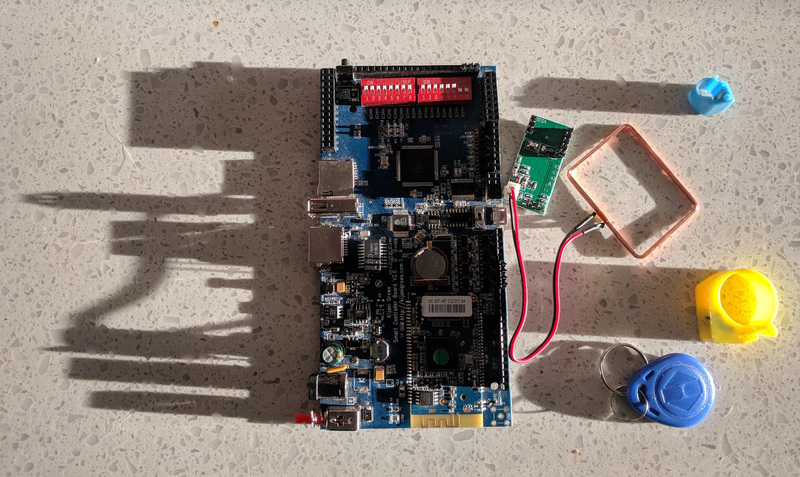 I must admit, I used to think modeling and programing systems for fish and plants were challenging – but they really don’t move. 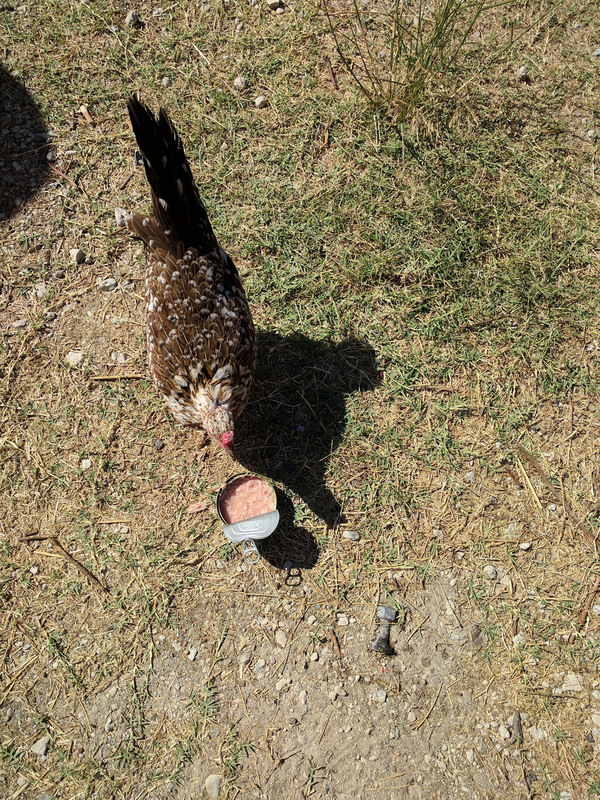 I had not experienced chickens – they are a new level. 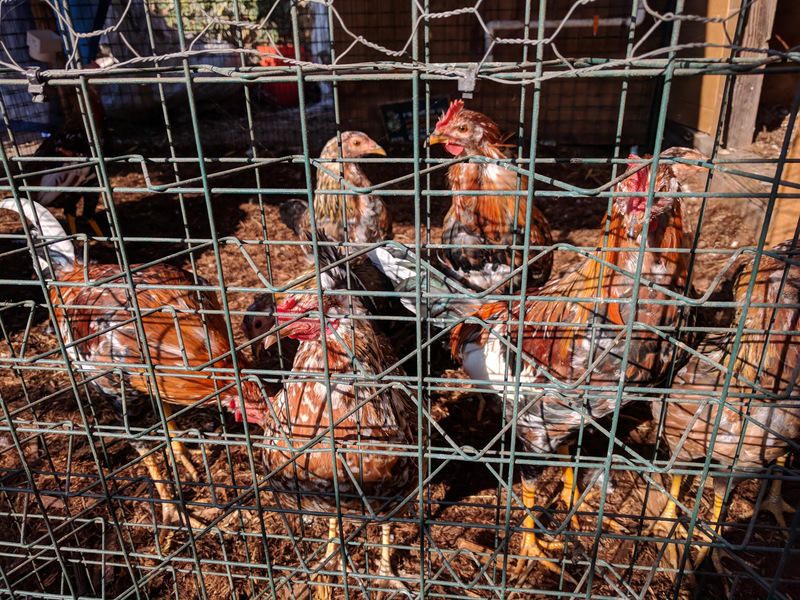 Next time a chicken gives you that look of “Hey – free range me” … Please do, it’s the best part about poultry farming.